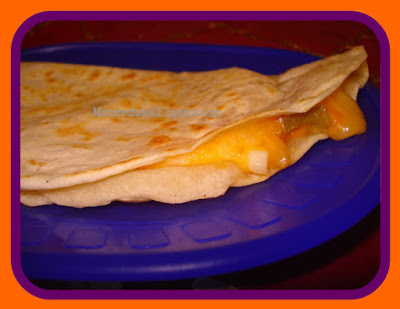 Quesadilla is a toasted tortilla with melted cheese inside. 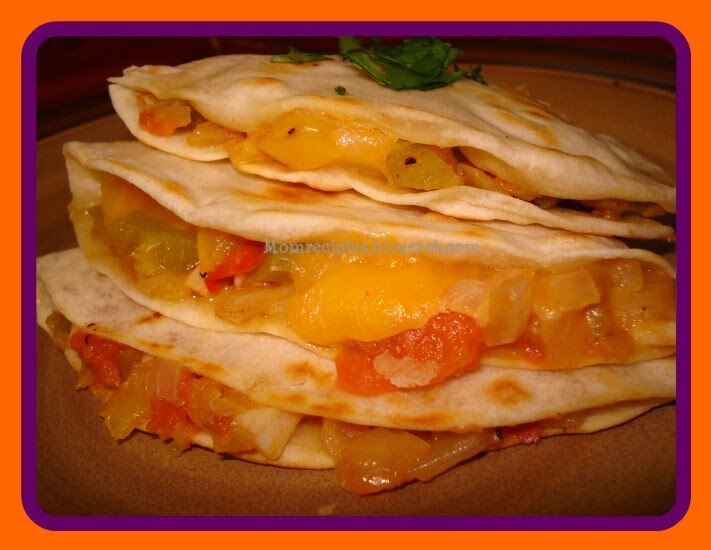 "Queso" is cheese in Spanish.But in addition to cheese, you can put anything in a quesadilla such as mushrooms, olives, tomatoes, onions ,bell peppers,Zucchini,squash etc.Vegetable Quesadillas are a wonderful vegetarian menu at Mexican restaurants.Quesadillas are very easy to make and kids absolutely love them. 3. Add all of the vegetables and saute for 2 minutes . 4. Add ground cumin ,Salt and pepper Powder. 5. Continue cooking until vegetables are tender. Keep mixture aside. 6. Heat a cast iron frying pan to medium heat.Add a drizzle of oil to the pan. 7. Place one flour tortilla on the pan. Cook tortilla 30 seconds, then turn. 8. Spread thick layer of cheese over the tortilla. 9. Then Spread thin layer of vegetable mixture over the cheese. 11. Press down gently with a spatula and cook 1 minute on each side pressing down with spatula until tortilla is light golden brown on each side and cheese is melted. 12. Remove quesadilla to large cutting board and Cut into quarters. 13.Repeat the process with the remaining tortillas. 1) Place scoop of vegetable mix on one side of a flour tortilla, top with grated cheese . Fold over. Heat in a skillet or pan.Cook each side of the quesadilla until it is brown and crispy and the cheese is melted. 2) Place 4 flour tortillas flat on a baking pan. 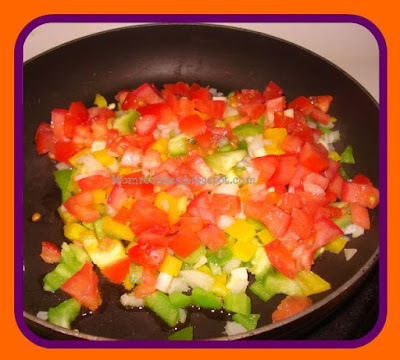 Place a large spoonful or a thin layer of vegetable mixture on a tortilla. Add a thick layer of cheese and cover with another tortilla. Bake at 375 degrees for about ten minutes, or until cheese has melted. Slice into quarters or 6 pie pieces, like a pizza. Serve with salsa,sour cream or guacamole. 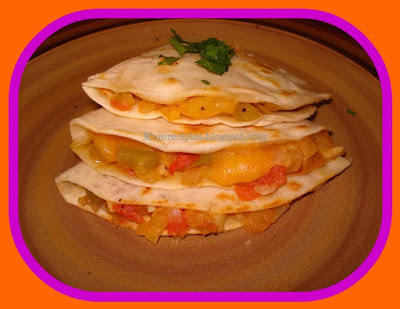 1) The stuffing for the quesadillas can be anything of your choice vegetables. Cheese can be omitted if desired and it will taste just as great. 2) You can spice it up anyway you like. 3) Also you can use any variety of tortilla and there are so many available in the grocery store.